Who Pays Taxes in America in 2019? For years, Americans have been told that the rich are paying a highly disproportionate share of the nation’s taxes. Claims to that effect often focus on just one tax, the federal personal income tax, which is indeed progressive overall. But when the nation’s tax system is viewed in its entirety, it becomes clear that the reality is very different. Despite their enormous incomes and wealth, the nation’s richest taxpayers are paying a share of overall taxes that slightly exceeds their share of income. As illustrated in the graph below, in 2019, the richest 1 percent of Americans will collect more than $1 in $5 of income in the United States (20.9 percent) and will pay a slightly higher share of the nation’s overall federal, state and local taxes (24.1 percent). Meanwhile, the poorest fifth of Americans will receive only a small fraction of the nation’s income (2.8 percent) and, as a result, will pay a small fraction of the total federal, state and local taxes (2 percent). Commentators seeking to create the impression that high-income households are paying an outsized share of the nation’s taxes tend to focus their attention narrowly on the most progressive taxes. It is true that some of our revenue sources are quite progressive, including the federal personal income tax, corporate income tax and estate tax. But Americans pay other federal taxes that are not progressive. For example, everyone who works pays the Social Security payroll tax. This tax does not apply to the investment income that most very wealthy families have, and it only applies to the first $132,900 of earnings a worker receives in 2019. Americans also pay state and local taxes that are particularly regressive, meaning they capture a larger share of income from low- or middle-income families than from wealthy families. State and local income taxes are much less progressive than the federal income tax, and some states have no income tax at all. Property taxes levied at the state and local level affect everyone who owns a home or other real estate and affect renters as well because landlords tend to pass on some of their property taxes as part of the rents they charge to tenants. State and local sales taxes are paid by virtually everyone. These are particularly regressive because poor families have little choice but to spend all their income buying necessities while wealthy families can save most of their income, shielding it from sales taxes. The figures in this report estimate combined federal, state and local taxes paid in the United States in 2019. They show that overall, our tax system is moderately progressive and people at every income level are paying taxes in the aggregate. 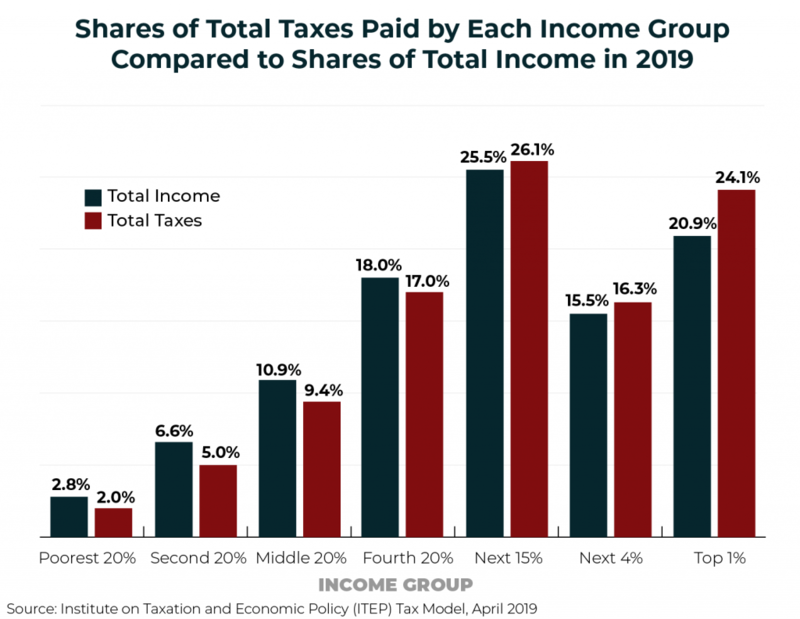 For example, the graph below shows that the effective total tax rate—the total federal, state and local taxes paid as a share of income—is higher for those at the top than for those at the bottom, but the difference is less than commonly believed. As illustrated in the graph, the bottom fifth of Americans pay a lower effective total tax rate, but they nonetheless pay a fifth of their income in taxes. The middle fifth of Americans pay about a fourth of their income in taxes, while the top 1 percent pay about a third of their income in taxes. The 2017 Tax Cuts and Jobs Act (TCJA), backed by President Trump and GOP leaders in Congress, lowered taxes for most households but most dramatically for the rich. As a result, America’s tax system overall is less progressive today. 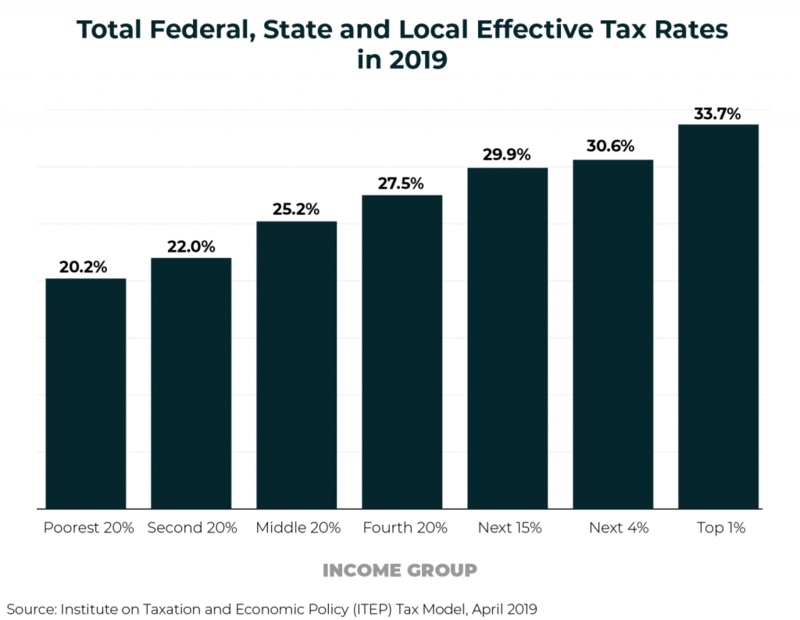 The total effective tax rates shown in the graph above are the sum of the federal effective tax rate and the state and local effective tax rate. 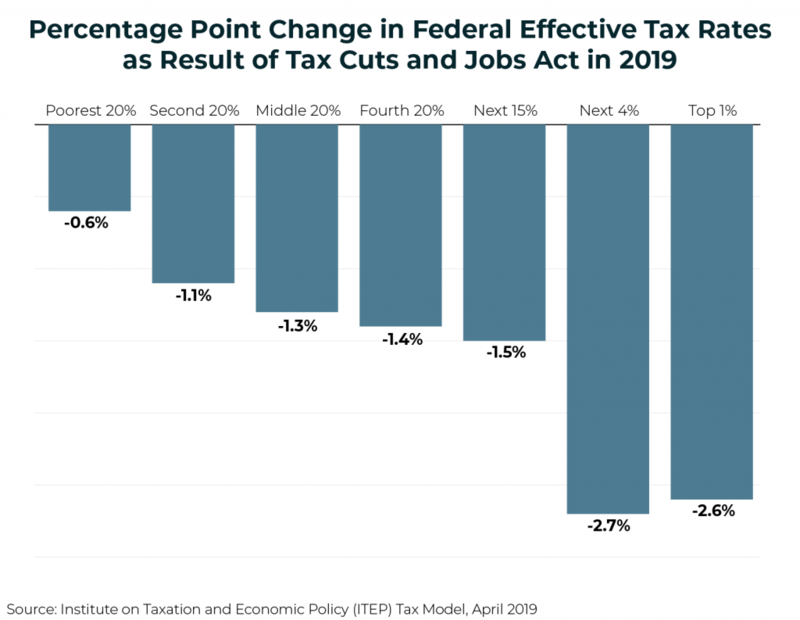 TCJA reduced federal effective tax rates for all income groups but reduced them more for the rich than anyone else, as illustrated in the graph below. TCJA reduced the federal effective tax rate by 2.6 percentage points for the top 1 percent and by 2.7 for the next richest four percent. For all other income groups, TCJA reduced the federal effective rate by far less than 2 percentage points. For the bottom fifth of Americans, TCJA reduced the federal effective rate by less than 1 percentage point. In other words, TCJA reduced taxes more for the rich, resulting in a less progressive tax system. 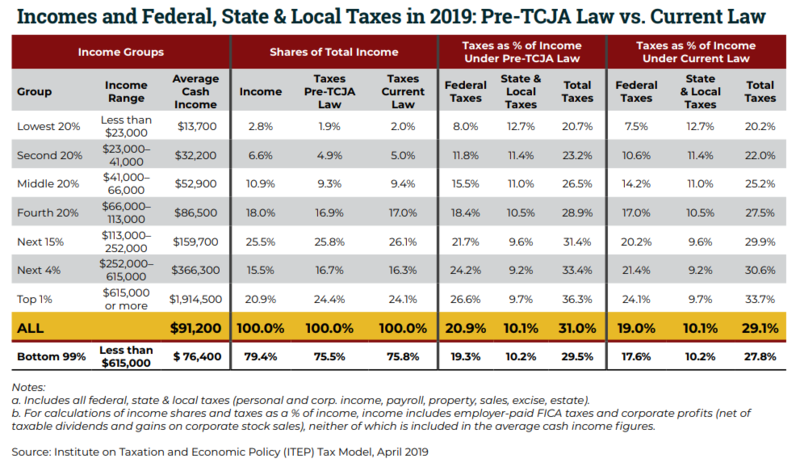 The table below provides the projected share of total federal, state and local taxes paid by each income group under current law and an estimate of the share they would pay if TCJA had never been enacted. For each income group, the red-shaded figure is the scenario in which they pay a smaller share, and the green-shaded figure is the scenario in which they pay a larger share. Current law results in a smaller share paid by the richest 1 percent and the next richest 4 percent. 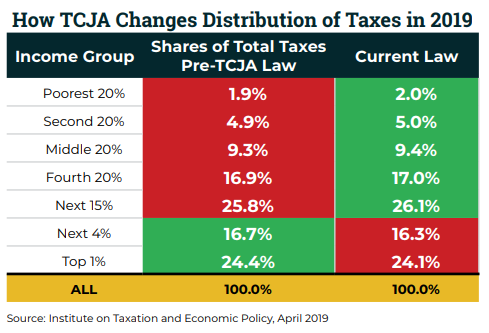 All other groups pay a larger share of total taxes under current law compared to what they would pay under pre-TCJA law. America’s tax system is moderately progressive and there are opportunities to make it still more progressive. State and local governments have many options to make their tax codes fairer. Another approach is for Congress to make the federal tax code more progressive, to offset the regressive impacts of state and local taxes. Some of those options involve repealing provisions of TCJA, but others would address problems in the federal tax code that predated TCJA. Corporate income taxes are paid directly by corporations. But like all taxes, corporate income taxes are ultimately borne by people. In this case the tax is borne mostly by the owners of corporate stocks and other business assets, which are mostly owned by well-off households. The estate tax applies only to the value of any estate exceeding $11.4 million in 2019 (twice that amount for married couples) and consequently only affects the very wealthiest families.